Hudson Baby Printed Mink Blanket with Dotted Mink Backing features a bright giraffe print in either rich blues and oranges or fun and fabulous magentas and yellow, with a coordinated solid color backing. 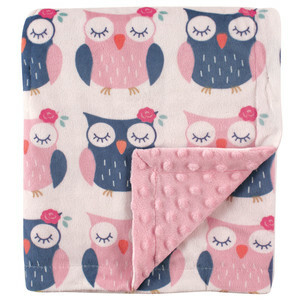 Sized at 30" x 40", this blanket makes an excellent crib blanket for chillier evenings, and the little bit of extra weight to this fabric soothes and comforts a baby learning to sleep through the night in their crib. The velvety smooth printed side of this blanket is soft against baby's sensitive skin, while the dotted side is fun for your little one when used for tummy time as a play mat. The layers are sewn together and topstitched to look like binding and to provide an extra measure of prevention when machine washed. 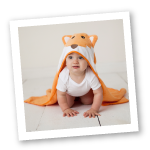 Each blanket arrives neatly folded on a hanger and tied with a matching ribbon, to make this an easy last minute gift or addition to a larger gift set for any baby shower or new arrival, and is easy to store in a closet until needed.